Photo: Justin Ritchie. Creative Commons BY-NC-SA (cropped). Competition to make bio-fuels out of waste products that would otherwise have to be dumped is creating a fast-growing, worldwide industry. And a German research organisation now believes it has perfected a system called a “biobattery” for turning a vast range of waste into energy. The drive for better technology has been spurred on by criticism that the first generation of bio-fuels used productive land that should be used for food crops, rather than to grow plants for ethanol and other fuels. That inspired scientists and governments to find ways of using everything from human waste to algae to power planes, cars and to make electricity. So many new companies have sprung up to exploit this new market and try to gain big backers for their projects that there is even a daily internet news site, BiofuelsDigest, just to keep up with developments. Germany has been the leader in Europe because it has made the political decision to phase out nuclear power and replace it with renewables. Biofuel plants are a key part of this revolution because the gas they produce is used to make electricity to balance out the shortfall when solar farms and wind turbines are not producing enough power. There are already 8,000 plants in operation in Germany, with an electrical output of 3.75 gigawatts in total − the equivalent roughly to three nuclear power plants. Some of these are the first generation that use food plants to make fuel, and so remain controversial. 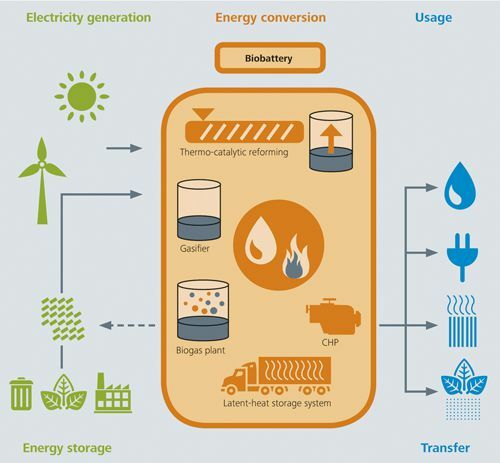 However, the Fraunhofer Institute for Environmental Energy and Safety Technology (UMSICHT) in Germany has developed the biobattery, which uses sewage sludge, green waste, production residues from the food industry, straw and animal excrement to create electricity, heat, purified gas, engine oil and high quality biochar (a form of charcoal). The scientists at UMSICHT, a research organisation that claims to be the leader in Europe for turning ideas into commercial ventures, believe that they can efficiently produce electricity and even marine and aviation fuel from the process. They built a pilot plant, which they say is cheap to set up and can be scaled up without the need for large capital resources. The other advantage is it saves the cost of disposing of material that would otherwise be waste. “We can utilise a number of raw materials that would otherwise have to be disposed of, often at great cost,” says Professor Andreas Hornung, director of UMSICHT at the Institute’s branch in Sulzbach-Rosenberg. To make all this work efficiently, the biobattery is a series of environmental technologies bolted together in one complex. They include biogas plants, thermal storage, carburettors and engines to produce electricity. At the heart of the system is a process called “thermo-catalytic reforming”, which turns organic material into carbon. This is then processed to make oil, gas or coke. The process is continuous, feeding raw material in one end and mixing it up without oxygen with a continuous turning screw. The material is heated up to break it down into charcoal and gases. These vapours are then heated up again and cooled down to create bio-oil and water. The remaining gas is purified and collected. The liquid, gaseous and solid products can be re-used in various ways. The oil can either be processed into marine and aviation fuel or used in a combined heat and power plant, as can the gas, to produce electricity and heat. The separated process water, which contains numerous short-chain biodegradable carbon compounds, can be fed back into the biogas plant to increase the methane yield. The biochar is ideal as a soil conditioner. A number of pilot projects have been set up in Germany and elsewhere in Europe to test whether the system is economic in practice. The gas and other fuel produced are already being used commercially. The construction of bio-plants using waste that would otherwise have been sent to landfill is being driven across Europe by a landfill tax imposed by the European Union to encourage local authorities to re-use waste, recycle it, or use it as fuel. It already cost £80 (US$122) a tonne in the UK to dump waste, and it will rise to £82.60 next month. This has caused many landfill sites to shut. Construction of bio-plants using waste is being driven across Europe by a landfill tax imposed by the EU to encourage local authorities to re-use waste, recycle it, or use it as fuel. The amount of waste going to landfill in the UK has dropped from 100 million tonnes in 1997 to the current figure of 30 million tonnes. Landfill companies are now separating elements of the waste so it can be recycled or processed into a variety of fuels. This bio-revolution has been possible only because the landfill tax makes the alternative of disposing of the waste so costly that it is more economic to turn it into fuel. The new German bio-battery and a host of other inventions pushing their way onto the market mean that the cost of electricity produced by the technology will continue to fall, as wind and solar energy have already done dramatically in the last 10 years. 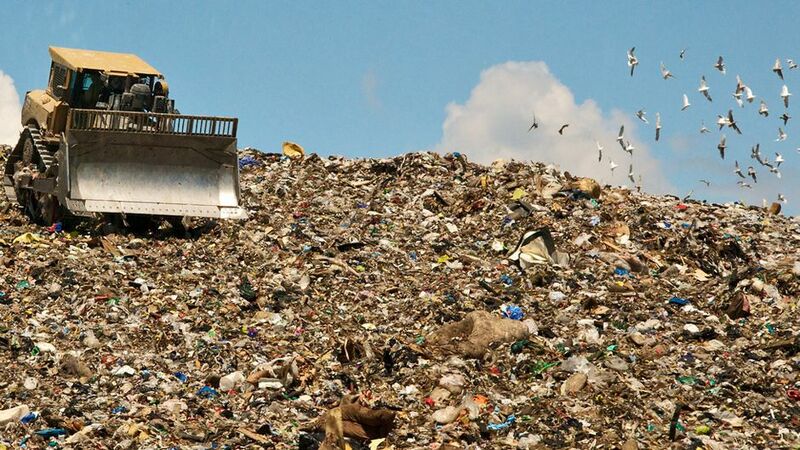 Waste-to-Energy Revolution Boosted by Biobattery Idea by Paul Brown/Climate News Network is licensed under a Creative Commons Attribution 4.0 International License.